Welcome to Eco Green Tours Prague ! We would like to invite you to sightseeing of capital of Czech Republic - Prague in electric vehicles which let you find out about an incredible number of amazing historical sights and places in Prague in an exceptionally comfortable and pleasant way. Eco Green Tours Prague is the one and only company that offers a chance of sightseeing of Prague by an electric car. You are welcome to look through our offer. May weekend in Prague? Discount for facebook fans ! NEW !!! Transparent panoramic roof in our vehicle !! 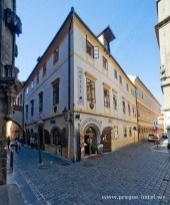 Find us everyday from 9:30 a.m. to 8:00 p.m on Tynska ulicka, next to church of Our Lady before Tyn. Your advertising on our vehicles? Write to us. We wish to inform you that in February 2013 we will not provide our service. This break is related to the maintenance and preparation of the vehicles for the next season. December 2012 - HEATING in our vehicles. On 4 October, we launched a new web site for our customers. Welcome to cooperate with hotels restaurants and travel agencies.